Bullous disease can occur alone or in conjunction with lung emphysema. Bullae vary in size and the term “giant bulla” is used when lesions exceed one-third of the hemithorax. Giant bullae may impair lung function and cause respiratory symptoms—mainly dyspnea and low exercise tolerance—negatively impacting patient’s quality of life. Bullous disease can lead to complications such as pneumothorax, infection and bleeding. Therefore, surgical treatment of bullous disease through bullectomy is indicated when complications occur or when giant bulla are associated to respiratory symptoms. An increasing giant bulla can also be considered for surgical resection, even when asymptomatic. The surgical aim is to remove the giant bullae, allowing expansion of the remaining lung, in order to restore respiratory function. Patients with large bullae and normal underlying lungs are those who accomplish the best results, but surgery should not be denied to emphysematous patients until a preoperative assessment is made to properly outline risks/benefits. 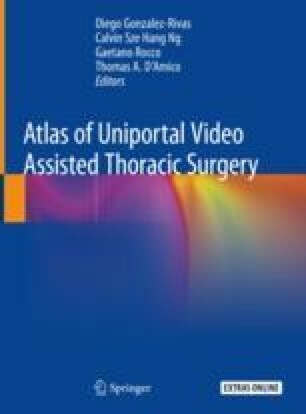 Uniportal video-assisted thoracic surgery is a feasible and safe method to perform bullectomy, with results at least comparable to other techniques, leading to symptoms resolution, improved lung function and better quality of life. This chapter will focus on this approach and its technical details. The online version of this chapter ( https://doi.org/10.1007/978-981-13-2604-2_13) contains supplementary material, which is available to authorized users. Conflict of Interest Statement: The author has no conflicts of interest to declare. Consent: This chapter shows pictures and videos of two cases operated by our group. Written informed consent was obtained from both patients for publication of the selected material.